Home / Uncategorized / Giveaway Day at Sew Mama Sew! Giveaway Day at Sew Mama Sew! Note: The winner of this giveaway is Tammy, who loves peanut butter cookies and homemade fudge. And guess what – you all have put me at well over 1000 Facebook followers/”likes” (and made me very hungry with your cookie ideas) so THANK YOU! Happy Holidays! Guess what? Today is Sew Mama Sew’s Giveaway Day and people are giving away all sorts of great fabrics and sewing supplies. 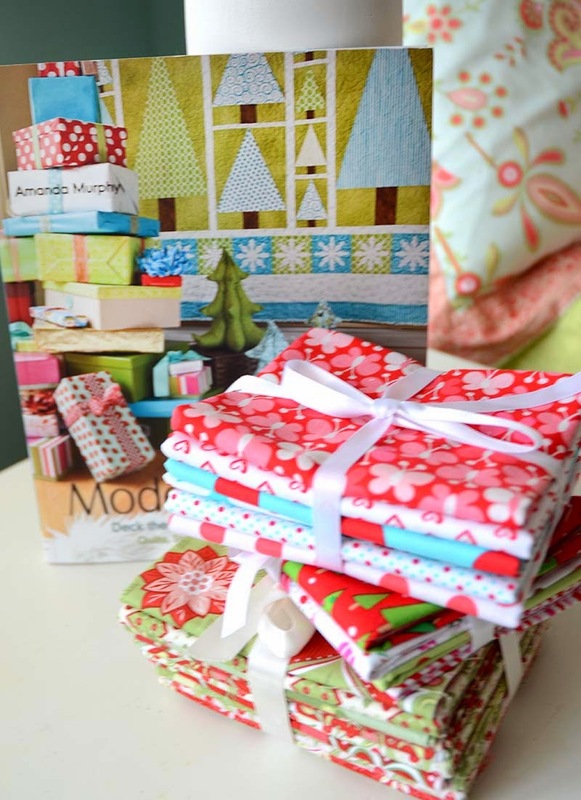 Here I am giving away a copy of Modern Holiday along with three different fat quarter bundles. One is from my Holiday Bouquet line for Blend Fabrics. A second is a red and aqua Michael Miller bundle from my Crossroads quilt and the final bundle is a bit of Christmas Candy by Doodlebug Designs from Riley Blake that I used in the Christmas Gifts quilt. All three will go to one lucky winner! To enter simply leave me a comment on this post telling me what your favorite holiday cookie or treat is. And please hop on over to my Facebook page and “like” it if you have a chance – I’m close to getting 1000 followers and we’ll be making some cookies of our own to celebrate once we reach that goal! The deadline to enter is midnight on Friday, December 13th. Be sure to hop on over to Sew, Mama, Sew to check out the other giveaways! Previous post: “Perfect Projects for the Holidays” is live on the Quilt Show! I like mince pies and shortbread. Cappuccino cookies are my favorite. I love anything with pumpkin in it, especially pumpkin bread and pumpkin cheesecake! I love Lebkuchen, very famous cookies from Germany. Thanks! What an awesome giveaway! Love it. I make peanut butter kiss cookies at Christmas; they're a family favorite. My personal favorite is peppermint ice cream. Merry Christmas! I like Divinity! Thanks for the giveaway. I love my grandmother's cutout sugar cookies with LOTS of pretty sprinkles. I like peanut butter cookies with m&m's. What a great giveaway Amanda. I would love a copy of your book!!! I love Christmas fruit cake! I really missed it when we lived in the US. Thanks for the giveaway. Love the look of your book and all your fabric is gorgeous. I love the Tatos, in Italian recipe from my mother-in-law. Many thanks for the great giveaway. I love shortbread cookies the most. Thanks for the chance to win your beautiful fabrics. I love magic cookie bars. We're making some soon! I love mince pies, followed closely by Christmas cake! Thanks for the chance to win – it looks like a gorgeous prize! Sugared pecans dipped in chocolates! Gingerbread men are my favorite holiday treat! What a generous giveaway! My favorite Christmas treat would be Pioneer Woman's cinnamon rolls. We make them for Christmas morning. Yum! I make a peppermint merangue(sp) cookie that I just love. It's light and airy and just melts in your mouth. Thanks so very much for the giveaway! What a wonderful giveaway! I love sugar cookies, easy, fun and delicious. 🙂 Thanks for the fun! English toffee squares – delish! What an awesome giveaway Amanda! I'm a stickler for a good old fashioned sugar cookie with icing! Just something about them that I crave during the holidays. Yummy! Thanks again! I do love the sugar cookies with homemade frosting. :) Great giveaway! oh i love a good pumpkin cookie. thanks for a great giveaway! For me it has to be Christmas cake – I wish I could have it all year round! Russian Teacakes are my favorite holiday cookie- yum! I love gingersnaps! I have only one other person who likes them in my family and that is my son! Mince pies, Christmas cake, and cadbury chocolates….my mouth is watering now! Thanks for the giveaway. I am a new like/follower on FB! Snickerdoodles! Thank you for the chance to win. I love your blog. My favorite treat all the time is coffee. Throw in a nice crunchy cookie like a gingersnap and I'm good to go. I love the sufganiyot (jelly donuts) we have at Hanukkah! I love almond bread. Christmas is the only time I make it. Thanks for the lovely giveaway. I make little shortbread cookies studded with candied fruit and they have to be my favourite this time of year. Thanks for a wonderful giveaway. Wow, thank you for the awesome prize! I've recently discovered these oatmeal carmelita bars. I think I'll make a whole bunch and give them to all the neighbors! I love me some mince meat pie. We usually have it around the holidays. love those fabrics and would love your book – thanks for the giveaway – my favourite christmas treat is pavlova ! oh and I liked your facebook page too ! i love homemade peppermint bark. Mojito Cheesecake made with a ginger biscuit bake…delish! Thx for the giveaway! Bacon Roll-ups! So yummy! Thanks for the chance to win! What a generous giveaway, and lovely too, thank you! My family's favorite holiday cookie is chocolate gingerbread, frosted of course, MMM! I am in the baking mood, and will be making these soon. Merry Christmas! Its a toss up between chewy molasses cookies and bahklava. Both of which I usually only make during the holidays. My favourite Christmas treat is Nigella's Christmas rocky road. I love your fabric selections. My favorite holiday treat is a cookie we've dubbed "mint balls." I don't even remember what the recipe started out as. My favorite treat is Salted Caramel Butter Bars. They are amazing! My favorite holiday cookie is the old standby sugar cookie cut out in holiday shapes and covered in a variety of sprinkles. I have been making (or having ) these cookies every Christmas for as long as I can remember, it is just not Christmss witnout them! I just "liked"you on facebook, sorry that I did not do it sooner. My favorite holiday cookies are my Great Grandma Quayle's Spritz. My family have been eating these since before she was born. Not really my favorite, but I always make Hershey Kisses (peanut butter) cookies for my brother's family. Very sentimental reasons. Christmas crack is one of my favorite indulgences! Gingerbread cookies are my fav.Giveaway is amazing,so generous of you.Thank you for the chance to win it. My favourite treat at Christmas is traditional Christmas pudding. I only indulge in it once a year with lashings of custard and cream. Can't wait. Thanks for the giveaway. Great giveaway! Gotta go with spritz cookies! I love to make (and eat!) frosted cutout cookies with my grandkids! I love frosted sugar cookies! They only come around once a year and I enjoy them while I can. Thanks for the chance at those great prizes! My family makes this soft sugar-like cookie with powdered sugar frosting drizzled over it. Yummy! Southern Comfort Vanilla Spice Eggnog…yum! I love gingerbread. It is the only time of the year I get it. Favorite Christmas cookie is a lemon bar- tart and sweet together! Any cookie is yummy! Love decorated sugar cookies with a nice cuppa coffee. Thanks for the opportunity to win your lovely giveaway. Peanut butter blossoms cookies, yummmmy! I love Pumpkin Cheesecake! Thank you for the great giveaway! Peppermint bark is my favorite! Hi Amanda! I liked your facebook page. I have all kinds of holiday favorites, but right now I'm focused on boiled custard, something my hubby turned me on to, but we can't find here. This is a yummy idea. I had shortbread as my favourite for many years but now I also love white chocolate Tim Tams!! My favorite is Divinity Fudge. Thanks. Wintery white chocolate chex mix 🙂 Nomnomnomnom. Beautiful fabric! Thanks! I "like" your facebook! Congrats getting SUPER close to 1,000! Would you believe I actually like fruitcake! for real!! liked you on Facebook. I think I was follower 941! I love my oatmeal cookies with craisins, nuts and chocolate chips. It's not a pretty cookie for the cookie exchange, but oh so delicious. My favorite holiday cookies are snowballs!! Thank you so much for the chance!!! Crown Jewel cookies. Love the raspberry jam in the cookies. Chocolate anything is fine with me! I have always been a big fan of fudge, but I'm developing a deep relationship with peppermint bark. My grandmother's fruitcake recipe… even people who hate fruitcake love this fruitcake, it's to die for and it brings back wonderful memories! Thanks for the beautiful giveaway! Peanut butter cookies with a chocolate kiss in the center….yum! I love cream de menthe bars, peanut butter blossom cookies and sugar cookies. Sugar cookies,Fudge and Buckeyes…. the list goes on and on 🙂 Thanks for the chance to win! Greetings! My favourite cookie is a simple shortbread cookie, pressed with a fork and a candied cherry bit on top. I love butter cookies that are dipped in chocolate. I love cranberry coconut sugar cookies! They are so very good! Homemade peanut butter cups. Yum!!! I love molasses cookies and pizzelles! Frosted sugar cookies! Those are my absolute favorite of all time and I love making them too, in shapes of little vintage campers! I love a cookie that my grandma used to make and now I make them called Russian Teacakes. Some people call them Snowballs. I love a cup of coffee with a couple. It just says Christmas to me! Grandma's Soft Cream Jumbos cookies are my favorite holiday treat! Thanks so much for the chance! I love peanut butter cookies with hershey's kisses in the middle – yum!! Love shortbread cookies dipped in chocolate! I love buckeyes, the peanut butter balls covered in chocolate. Thanks for an awesome giveaway! I love peppermint hot chocolate and almond butter cookies. Thanks for the giveaway! My favorite holiday treat (and gift) is white chocolate peppermint bark…yummy, and so easy to make. I love a good biscotti (chocolate is best). Dunked in a nice hot coffee on a cold winter day! Best holiday treat ever! I love some fudge with pecans! I like to make Italian biscotti, all flavors. I love gingerbread cookies with cream cheese frosting! Hi Amanda, I watched you today on The Quilt Show….Thanks for showing how to do the inverted binding corner ! My favorite Holiday treat is Marshmellow Roll ! I love marshmallow cream fudge! I need to make some…. I love peanut butter cookies. And any kind of homemade fudge. I am already a Facebook page follower of yours. Thank you for the chance to enter. I love your book and have wanted it for some time now. And the fabrics are amazing as well. My mom used to make a cookie called "Gitter Cookin'" — a slightly spiced base with jam on top. Still my favorite! Absolute favorite is Cranberry Bread. Grandma's best recipe. Not too sweet – always hits the spot. Happy holidays to you! I like my aunts sugar cookies with orange icing. Buckeyes! Everyone in my family made them and I would eat as many as they would let me at all the Christmas parties! Im glad I found you on facebook! I like chocolate cake with chocolate icing! M&M cookies are the best, thanks! Every year we make a Holiday Party cookie. It's a family favorite. Thanks for the giveaway! My favourite holiday treat is Speculas. They are a spiced German/Dutch cookie. I love my mom's sour cream coconut cake that she makes every Christmas Eve. Thank you so much! My favorite is what we call Kitchen Sink cookies. Full of nuts and chocolate and coconut and dried cherries….yum! Your giveaway looks yummy, too! I love the nut rolls! My Husband & I make Caramel Corn every year! Give it as gifts too. Toffee, peanut butter cups & pecan cookies to name a few favorites. I just love all the goodies you can make this time of year. Thank you for your generosity. I just posted one of my favorite cookie recipes, Snowball cookies. I shared it at Just Let Me Quilt. She's having a virtual cookie exchange. Great giveaway!! Ginger cookies! Thanks for the chance to win. I love Jam Stars. I use a recipe that my grandmother used. I use homemade raspberry jam and the cookies are delicious. I love chocolate so at Christmas time we make homemade fudge. It is hard to resist. I also love molasses cut out cookies. Thanks for the chance to win your giveaway. I love gingerbread cookies! So yummy! Great giveaway! My favorite holiday treat is a chocolate peppermint trifle that I make. Really love these giveaway, thank you!!! I love chocolate snowflake cookies. My favorite holiday treat is cenci (Italian) or kruschiki (Polish) — they're basically the same cookie, but my parents grew up having them with different names. Now my father makes them at New Year's and I wait ALL YEAR for them! Thanks for this giveaway chance – this stack is so fun! I love fruit mince pies that my Grandmother used to make (from scratch) so well. Every time I eat one I am transported back to my childhood. my favorite is a soft peanut butter, with a mini peanut butter cup in the middle…made once a year for everyone's pleasure. Fave cookie: Vanillakipferl, fave holiday dinner: Fondue. I thought I was a FB follower but by cracky I wasn't. I have since rectified that error and am #958. Merry Christmas my dear friend. I love molasses cookies dipped in white almond bark. At least that is what I think the white is. I'll have to find out as I don't make them myself. I love to do baking of special little sweet treats for Christmas. One of my favourites is a rich fudge cake I call Judy's Special Fudge Cake. It is very moreish. I love fudge with lots and lots of walnuts!! I love the traditional swiss cookie, called Brunsli, chewy and spicy and sweeeet. Oatmeal wreath cookies are my favorite. At this time of year I love mince pies! I love the portuguese "arroz doce". I love aniseed biscuits. They are really good and taste so good!!! Old time favorite – Chocolate Chip! Thanks for the chance to win your wonderful giveaway! I enjoy getting to have some of my mother-in-law's divinity as well as eggnog. I love eggnog. It's sold here at a dairy store around Easter, also. I gave your FB page a like to help you out. All the best! I love Thumb Print cookies… but seriously ANY cookie or sweet is special because I rarely bake!! Hi Amanda! Wonderful giveaway! My favorite Christmas cookie recipe is Thumbprints. Love the centers to be either raspberry or apple mint jelly! I will miss not being at the Charlotte Modern Quilt Guild's Christmas party. Conflicts with another one. What a fabulous giveaway! I'm not supposed to eat them, but I love chocolate covered peanut balls! 🙂 Thanks for the chance to win such a lovely pattern and fabrics! I love pumpkin pie! Thanks for the chance win. My grandmother's poppyseed rolls. Thanks for the opportunity to win! I make cookie dough truffles at Christmas. They are amazing! Thanks for a great giveaway. One of my favorite cookies that I make each year are the Lemon Bar Cookies from the Barefoot Contessa and another favorite my family insists be included are the Raspberry Almond Bars from Taste of Home. My aunt always makes these Christmas cookies that are……heavenly!! She decorates them with beautiful icing and some of them have red hots on them which are my fav. I have been known to hide these gems from other family members. It's worth the risk of Santa finding out….lol!! As always, you are such a wonderful bright inspiration. Thank you for the opportunity to win! My favourite Christmas treat is Christmas cake, this year my 9 year old daughter has made it and I can't wait to try it. Shortbread cookies with a big mug of steaming hot chocolate. What a wonderful giveaway , really have wanted the book, and the rest is a great bonus. Thanks for the opportunity! I always make sugar cookie cutouts. I love decorating them too! Cookies! My big weakness, I love cookies! Thumbprints with jam, sugar cookies, hazelnut crescents…..really hard to pick just one. Spritz cookies! Thanks for a fabulous giveaway. Favorite holiday treat would be Egg Nog. I love the pretzel, rolo with a pecan squished on top "cookie". It's so yummy! It would have to be Stollen (bread with marzipan inside) thanks for a great giveaway! My fave is homemade fudge! My favorite is chocolate fudge and a pecan log roll that is to die for!! Spritz cookies and iced sugar cookies, which I'm having for breakfast today. Bourbon slush lol 🙂 Thanks for the chance to win!! What a fun giveaway! I love to make chocolate crinkles! They're my Grandmother's recipe and I don't know how they became a "Christmas" recipe at our house, but they are so delicious!! Snickerdoodles! Love making them with my kids. cinnamon snowballs !!! thanks for sharing! My favorite holiday cookie is my mother's Sugar Cookie recipe. I've never found another one like it! Today I have a hankering for some gingerbread! i loove choc chip cookies.. thanks for the giveaway! I love crandberry shortbread that I make. I'm gluten free this year, so I will have to find something new. My mom and grandmother made a wonderful applesauce cake that always says Christmas to me when I smell it baking. Not a cookie, but definitely a treat. I love cut-out butter cookies with frosting and sprinkles (oh, the sugar high). I also liked you on FB. Thanks for the awesome give away. I would love to win your book. I love the New York Times Chocolate Chip Cookie recipe. It is so good. I make it every Christmas. I am a new follower through Facebook. Congrats on your (almost) 1000!! Our family favorite is Sugar and Spice cookies. Fabulous giveaway…sweet! I already "Like" you on FB. I love to make gingerbread people and save some to decorate with a tube of fabric paint, spray with clear coat and hang on my candy tree in the kitchen. Brown sugar squares….or maybe toffee cookies. Hard to pick a favorite, but it's those two at the top of the list. Love to eat frosted sugar cookies and make homemade cinnamon roles. My favorite holiday treat is snickerdoodles! I love the Butter Horns my Nana makes. Super delicious! Thanks!! thanks so much for the chance. I have to say I am quite partial to Candy Cane Chocolate cupcakes! That's tough to choose! But I really love pecan pie, homemade and wonderfully delicious. Thank you for such a wonderful prize! Sugar cookie cut outs are my favorite. In fact, it's about time I started making some :-). Thanks for the very generous giveaway. A recipe given to me by my mother-in-law "Hello Dollies". thanks for such a generous giveaway. my favorite treat at Christmas is gingersnaps. The best holiday cookie is peanut butter drops with Hershey kisses! They always remind me of Christmas. Thanks for the giveaway. Love butter spritz cookies, but I'm also partial to caramels and peanut brittle. Love candy at Christmastime! REALLY LIKE THE PLAIN ALMOND FLAVORED COOKIES TO ROLL OUR +DECORATE!MERRY CHRISTMAS! I love all kinds of cookies! I love iced & sprinkled cut-out sugar cookies! I think I found a new favorite cookie this year. It's a gingerbread chocolate chip. The recipe is from SugarHero's blog. Just made them last night and had to hide them because hubby and I made a HUGE dent in them!! Peanut blossoms, I only make them at Christmas. There is nothing better than a peanutbutter cookie with a warm chocolate kiss on top. Thanks so much for the awesome giveaway! I love frosted sugar cookies. And speaking of Christmas, I love your holiday squares quilt in the Christmas fabric. Thanks for sharing! I can't wait to watch your work on the Quilt show! I love mince tarts. I had to do without for several Christmases until I learned to make good gluten free pastry, but now there's no stopping me! Thanks for the chance to win. Shortbread cookies with candied cherries in the…mmmm. Great giveaway! Thanks. I am more than happy to like your Facebook page! I love my mom coconut cookies. I love Gingerbread People. And I make them before Christmas. I'm going to try the recipe on Smitten Kitchen this year. Every Christmas my family insists I make my famous Seafood Newburg with lots of lobster in it. I've fine tuned and lightened the recipe over many years and everyone loves it. Secretly, I think that's why everyone heads back home for Christmas! LOL! My favorite holiday treat is peppermint bark. Yum! My favourite holiday cookie is called krumkaker, thats a very old norwegian thing. Love Soft Molasses Raisin Cookies. I don't know why I don't make them any other time of year but maybe I should remember to 'Eat Dessert First!' and make them more often. I am # 982 of your FB followers! I love apple cider caramels. Our favorite cookie is our family sugar cookie cut outs. Thanks for the chance to win fabric! I love thumbprint cookies. I might have to make some now that I've brought hem up. I make Christmas molded cookies. I've had the molds for years, and the family still asks for them, year after year! My favorite holiday treat is peppermint hot chocolate and cookies! I love eggnog, I really love eggnog shakes. My favorite are shortbreads, I eat too many of them! Shortbread with sprinkles mixed through it. Yum! My favorite is the Mexican Wedding cookie. I really love the jam sandwich cookies my grandmother makes for the holidays 🙂 Thanks for the chance to win! A smooth, firm fudge with lots of nuts! Fudge with walnuts and gingersnap cookies. Thanks for the chance at your awesome giveaway. Thank you so much, Amanda, for you awesome giveaway. My favorite holiday cookie is Frosted Sugar Cookie. thanks for the sweet giveaway! My favorite cookies at the holidays are gingerbread men! My favorite is pixel led. I only make them at Christmas time since they are time consuming. spritz, a buttery cookie using a cookie press. Lots of shapes and lots of colors possible- great flavor! Love all the fabric! Sugar cookies! I love my mom's Dutch gevulde speculaas. mmmmmm! My favorite goodie is Salted Caramel Butter Bars. 🙂 Thanks for participating! It's not really Christmasy, but we always make it at Christmas – called Puppy Chow – Rice chex, covered in melted chocolate and peanut butter, then covered in powdered sugar. Really does look like puppy chow, but oh so good! Thanks!! I like butter shortbread star cookies . I love rainbow marzipan cookies. I love eating dried grapes covered with chocolate ! Thumbprint cookies with raspberry jam. Pecan pie is the best ever! My favorite cookie is the Jam Thumbprint – nothing fancy just yummy!!! Stollen! The mix of candied citrus, fruit and spices just screams Christmas. Thanks! I love to make (and eat) rum cake and candied pecans!! Loooove this giveaway! I love having the sugar cookies my daughters make every Christmas eve! What a great blog and beautiful fabric! I love Lebkuchen. It's a Christmas cookie from Germany. We have it every year. Makes us miss home! Happy Holidays! Growing up we always had a fresh coconut cake…my dad would hammer nails into the coconut so my mom could drain it and make the cake. Sooo good. These days I like anything chocolate, mostly brownies over cookies. I love shortbread and Christmas cake. Probably Venetians (italian layer cookie). Hard to choose – butter crescents, snowballs (Russian tea cakes), or anise flavored butter candy canes… now I am HUNGRY! My favorite treats is is homeade turtles. These are a favorite in the goodie bags I make. We love sugar cookies with cream cheese frosting – and I love your quilt designs! Thanks! My favorite holiday cookies are Creme Parisian Wafers. They are two pastry circles with a fluffy butter frosting between. Contact me if you want the recipe. I love Mama Grayce's Originals…great grandmother's recipe. They are tiny puff pastry tarts filled with a brown sugar and coconut mix. Then they are glazed with either orange or lemon glaze. Thumbprint cookies with raspberry jam are yummy!!! I love most cookies though. Mint truffles. I only make chocolates at Christmas. Thanks. My favorite treat is peppermint mocha creamer for my coffee! It is only out this time of year! My favorite cookie is datenut pinwheels! They are so yummy!!! My Mum makes a delicious pistachio biscotti, they're really addictive so it's probably a good thing she only makes them at Christmas! Thanks for the great ,giveaway! I love Snickerdoodles and chocolate pie!! I just love your fabrics! I love any baking that I don't have to make. I just love a good old fashioned butter shortbread. I love my great grandmas Irish raisin soda bread during the holidays. It's the only time of year my grandmother made it, and there was nothing better on Christmas morning than that toast slathered in butter. I don't like sweets, so that was my holiday treat. I was fortunate enough to get the recipe before my grandmother passed, and it's carried on to my children as a tradition. I so enjoy your patterns and fabrics! Thanks for the chance to win, my favorite Christmas treat is the Pecan Tarts I make each year. I like to make cut out sugar cookies and let the kids decorate them. Thank you for a lovely giveaway. I like the coconut and chocolate ones my SIL makes me every year. I love toffee, in fact I need to make some… tonight, ok, it's a little late for cooking sugar, tomorrow then! Thanks! We make a lot of cookies….but my favorite has to be the thumbprint cookie with my mother in laws strawberry jam in the center! My favorite treat is egg nog. My favorite holiday cookie is monster type with butterscotch, chocolate chips, and nuts, one of our friends brings them every year. My favorite holiday treat is peanut brittle! We love carmel pretzel rods dipped in chocolate! Yummmmy! What a fun give-a-way! Wonderful giveaway! I looove lemon cookies, sugar coated. Yum yum! Your question is making me hungry…I can feel the pounds growing on my hips…old fashion cut and decorate sugar cookies with sprinkles! My favorite cookie at the holidays is gingerbread… i have an old recipe that was handed down from a mother of one of my brother's friends that involves rum, and they are yummy! Love making Cutout gookies & decorating them with my Grangirlie. But we make Caramel Corn too, and give as gifts to Friends & Family. Holy Smokes! What a giveaway. My Nanny was a British war bride and brought with her her English traditional recipes. Christmas wouldn't be Christmas without plain old buttery shortbread. butter tarts! not a cookie, I know, but still…. Dutch kruidnoten covered in chocolate! My favorite holiday treat is cocoa and my favorite holiday cookie is molasses crinkles. Thank you! I love the pumpkin pie, cream puffs, and chocolate covered goodies. yum! Thanks for the giveaway. I love home made short bread for Christmas. Mine would have to be Rum balls, yum! Beautiful giveaway, those fabrics look divine! I love making shortbread and gingerbread! thank you!! White chocolate, cranberry and pistachio rocky road. I love all of the appetizers, dips, and salty/cheesy treats that are at holiday parties (I've always been a salty over sweet gal). Thanks for your lovely giveaway! My favorite holiday cookies are rumballs. Thanks for the chance to win! We always have molasses cookies this time of year! my favourite is Gingerbread men. Thanks for a great giveaway. My very favorite cookie is the Snickerdoodle! Just saying it makes me smile! i love peppermint bark…and melting Andes mint chips on hot brownies. love!!! thanks for a chance Amanda! Love my "once a year' shortbreads. My fav cookie is one my grandma makes Danish Almond Rings – I can eat them like popcorn! I love orange butter cookies and not only on Christmas! Frosted sugar cookies are my favorite treat for the holidays. My favorite holiday cookie is gingersnap. It's about time to make another batch! Gingerbread cookies are my favorite. Thanks for hosting. I love buckeye candy! It's a special treat during the holidays! I love tiramisu, I always make it during the hoidays. I love chocolate cookies 😀 I'm that easy! Nothing beats Mississippi mud pie. I've already eaten too many frosted sugar cookies. We take a lot of time with each one so my daughter doesn't like to eat them, more for the rest of us! Thanks for the chance! toll house dough but with red and green m & m's instead of choc. chips! the fabric you have chosen for the give a way is scrumptious! I love homemade peanut brittle and almond roca! Thank you sew much! I love to make and eat classic sugar cookies with icing! Shortbread & sugar cookies! Great giveaway, thanks for the chance! I love chocolate chip shortbread covered in cinnamon sugar. Thank you for a wonderful giveaway. I like soft sugar cookies. I love making molasses cookies at Christmas! I love sugar cookies with lots of frosting! Gingerbread! I have a gingerbread man pan that my mother in law used when my hubby was a kid, so fun to continue the tradition with our own sons. I like the iced sugar cookies. They don't taste the best, but making them with my mom, and now with my daughter, makes them seem extra special. I love cranberry shortbread ! And I whish you a merry chrismas ! Peanut butter blossom cookies with a Hershey's Kiss in the center. Beautiful! My favorite is the classic iced sugar cookie -yum! My go-to holiday cookies are peanut butter blossoms. yum! Raisin spice is my current favorite! Chocolate Chip are my favorite. Thanks for the chance to win. Christmas Cake(fruitcake, of course) is my favourite Christmas treat. Cut out sugar cookies! What a generous giveaway! Decorated Gingerbread cookies are my favorite! Jello popcorn! Thanks for the chance! Buttery spritz cookie in wreath shape with green icing leaves and red hot candies for the holly. How about some shortbread and sugar cookies and cheesecake! Yummy! I love homemade german vanilla crescents. Shortbread that would be my favorite. Ammonia cookies, good mennonite recipe. I love eggnog! From a local dairy. I love chewy ginger cookies. I really like pumpkin bread and rice or bread pudding. Eggnog! and cookies! Also my new tradition is baked brie- all cut up first- turns out amazing! and fits whichever container you bake it in! Thanks for the amazing giveaway! favorite is gingerbread cookies. just love them! I love Jam Thumbprints… but seriously any sweet is great in my books because I rarely bake… so it is a nice treat… with tea!!!! I Love Date Rocks. Lots of dates and lots of walnuts. I love the no-fail fudge that uses the marshmallow creme. I haven't made any yet but I have the ingredients sitting on the counter! I have honestly never met a cookie I didn't like ;), but my favorite are gingersnaps! I love the raspberry thumbprint cookies my grandma makes! My all time favorite cookie, no matter whe, are oatmeal craisin walnut cookies. Yum!! Your book has been on my Amazon wish list fkr some time now. I sure hope I win! Thank you!! I love cheese balls that are homemade and served with a side of crackers. We have them every year! I love peanut butter ritz sandwiches covered in chocolate. yum! I like pumpkin and cranberry walnut cookies! Thanks for the chance to win! We like Peanut Butter No=Bakes. I follow you on Facebook… good luck on your likes !!! Just gorgeous! I have made pound cake cookies every Christmas since I was given the recipe in 1987. Some recipes are worth repeating over and over again. Thanks for the chance! My favorite is my very dressed up ginger snaps-gingersnap sandwich with marzipan and raspberry jam, half dipped in dark chocolate. Love your blog. Soft gingerbread cookies… Wait, no, snickerdoodles. Maybe frosted sugar cookies. I like every cookie! I love bretzels- a flat sugar and butter cookie that my family has been making for generations. Yum! Anything pumpkin! Love the holiday smell! Plain old iced sugar cookies! Not sure anymore… just got diagnosed with a gluten intolerance which means no more cookies for me unless they are gluten free… which by the way I haven't found any yummy ones yet. I'm old fashioned, so I just looove sugar cookies. Thanks for the chance to win! My favorites are nut horns and pumpkin roll. I like shortbread — so melty and good. I love florentines -I only have them at Christmas! I love Lebkuchen, my German friends introduced them to me. I love sugar cookies, esp with sprinkles and colored sugar. My favorite holiday treat is homemade fudge. I love white chocolate chunk gingersnap cookies!! I love shortbread cookies, yum! Fabulous fabrics! Thanks for the great giveaway! My traditional cookie that I cannot forget to make for Christmas no matter what, is Chocolate Dipped Almond cookies! I love your work and your website. I love Texas Ranger cookies! fave holiday cookie treat is a sugar cookie with a peppermint hershey kiss in the middle! My mom makes the best chocolate mint cookies. My favorite holiday cookie is ginger chocolate chunk. I believe you can find the recipe at chatelaine.com Thank you for the very generous giveaway! I love Chai spiced snickerdoodles. I love the Nutmeg Logs my mom makes, also her babka on Christmas morning is a must! Pumpkin pie. Thanks so much for the opportunity. Christmas cake and cheddar cheese together! It sounds odd but it's yummy! Thanks! I like Russian Tea Cakes. Thanks for the chance to win! I'm a sucker for sugar cookies all frosted and decorated for the holidays. this time of year, i have to make a zillion spritz cookies! Awesome giveaway! All beautiful fabric! My favorite Christmas cookie is a good gingerbread man. Oh and already following on FB. Frosted sugar cookies are my favorite! I LOVE spritz cookies! Why do we only make them at Christmastime?? My favorite Christmas cookie is jam jams! Christmas pudding, and even better christmas pudding ice cream. Fab! Thanks for the giveaway. Gingerbread cookies…or black and white cookies, love them. I like practically anything sweet, so it's really, really hard to pick a favourite. But I'd narrow it down to pfefferneuse and butter tarts. Maybe. If I'm being forced to choose….. I love gingerbread cookies and gingerbread cake. I like my daughter-in-laws homemade marshmallows! My favorite christmas cookies are peanut blossoms! Thanks for a great giveaway! Iced sugar cookies and pecan pie! I received a gingerbread house cookie cutter set, and that has become a bit of a tradition at our place. This year I found a nativity cookie cutter set, and I can't wait to give it a go. Bring on the cookie madness! I like mince pies and gingerbread! I like lemon cheese logs. So yummy. Thanks for the chance to win. I like sugar cookies, thanks for chance to win. Bark, which is basically toffee topped with dark chocolate. I love everything but the calories! Thanks. I look forward to my mother's Scottish shortbread. I love Danish Kringle! Thanks! My favourite holiday cookie is definitely frosted sugar cookies. Such fun to make! I look forward to Christmas morning mimosas all year long! I do like you on Facebook. I love peanut butter blossoms. My mom's sugar cookies are my favorites. I'm partial to a snickerdoodle! love them! I love Spritz cookies, my mom and I make them every year. I am so excited for my dads homemade eggnogg. I love butter cookies made with a cookie press. Hi. Thank you for the giveaway. I was all ready to say my favorite holiday treat is fudge, but read someone else comment about shortbread and mince pies. Can I vote for all three? I'm generally not a sweets eater, but the holidays bring special treats that are hard to resist! I have always been big on all the traditional stuff like steamed pudding, fruit cake, shortbread and such,but I find them a bit rich now. Fudge is still high on the list though! Thanks for this great giveaway. My favorite holiday treat is potato latkes on Chanukah. I love chocolate and peppermint crinkle cookies, yum! I love to indulge in the Frozen Egg Nog that I learned about from Paula Dean many years ago. It is beyond yummy. My favorite cookie: savory cheese wafers. They're a welcome alternative to sweets overload at this time of year! Sugar cookies that you can decorate with children. What great memories! I have a friend that makes oreo balls. Love those!! Thanks for the chance to win! Chocolate. Always have been my favourite and always will be. Shortbread cookies are my favorite to make and eat. My favorite holiday treat is powdered sugar nut ball cookies. Happy holidays! My favorite Christmas cookie is still my mom's date balls – just dates, coconut and rice krispies. Easy and yummy! My favorite is the plain old sugar cookies and decorating them with my kids. I like making pecan tassies. They're a portable bite of pecan pie, yummy. Speculaas, Dutch cookie, mainly made 'cause of the spice mixture. I love my mom's Russian tea cookies. I would love to win your fabric and make the Christmas tree quilt. I love pumpkin pie, pumpkin cookies, pumpkin ice cream…..
Baklava…I only make it at Christmas because it is labor intensive and always leaves me a few pounds to remember it by. I love sugar cookies! And all the rest on the tray too…lol. It's not a cookie, but it is definitely a treat: monkey bread! It isn't holiday exactly, but my family only makes it at Christmas so it says holidays to me! Hi, I don't celebrate but I would love your giveaway. Do chips count? I love chips, i don't have much of a sweet tooth. Love the bundles you're giving away! I love peanut butter kisses! I love Pumpkin Log! I am going to try a new to me recipe today, cream cheese pumpkin bread. It my become my new favorite. I love Gingerbread! The taste, the smell …. I would love to win those bundles – they are fantastic! A new liker on facebook, can if I can find the bloglovin button I will be clicking that too! I love chocolate mint chip around the holidays! My favourite Christmas treat is a Greek cookie with syrup and walnuts, called melomakarona! If you ever get the chance, give them a try, they're worth it! I love frosted sugar cookies. I like mincemeat tarts. Thanks for a fabulous giveaway! chocolate mint cookies – thanks! I like Panettone, and German Stollen at Christmastime. russian tea balls (or wedding balls?) for sure. These friends of ours make the lightest fluffiest marshmallowest popcorn balls this time of year and they are so delicious. I make Lemon Crinkle Cookies to take to banquet parties. My favorite cookie is an old beloved refrigerator cookie recipe with homemade icing and decorations. I love rum balls, they are my favourite holiday treat! Oh my goodness. How exciting. I am over the moon. I have wanted this book ever since you first launched it…yeahhhh and the glorious beautiful fabric too…thank you so very much.